A small bed and breakfast in the Highland village of Newtonmore, ideally located for walking, bird watching and exploring the beautiful countryside around the Cairngorms. An 18 - hole golf course is within walking distance, and other local attractions and beauty spots are nearby. The attractive, Swiss - style house features comfortable, well - equipped rooms complete with en suite showers, hospitality trays and TVs. There is also a guest lounge with a selection of books, and a light and airy dining room. 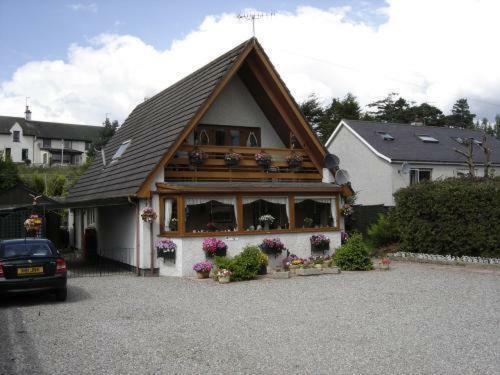 Glenavon House is in the style of a Swiss chalet, set back from the main Street in Newtonmore where we offer quiet and relaxing accommodation. There are three en - suite bedrooms, the twin room being situated on the ground floor. There are many facilities nearby, an eighteen hole golf course, fishing on the river Spey, many walks and climbs including the Wildcat trail around the village. Prices for a room start from £60.